Autumn begins on Saturday here in North America. That means lots of leaves falling from the trees, Halloween costumes and decorations in nearly every store, and recipes to warm our hearts as the days grow colder. 1. Cincinnati Chili— it’s the main dish at our Halloween party every year, and a staple in my household, wherever my household has been, for over 50 years. This is one where the vegetarian version is just about as good as the meaty version, its unique blend of spices making your house smell great and making your neighbors’ mouths water. 2. Maple Roasted Acorn Squash— I am most definitely not a squash lover, either in sport or in vegetable form. But this recipe, which I took out of Diabetes Forecast magazine, changed my mind about squash entirely. If you replace the maple syrup with a touch of honey, it’s just as good or better. 3. Potato Leek Soup— here’s a super easy recipe for quick potato leek soup, taken from Jacque Pepin’s Fast Food My Way. A quick lunch or dinner option, it really hits the spot. Bolus appropriately. Note: recipe starts at around the 4:15 mark in the video. 4. Crab Dip— crab is something that I never enjoyed in my life before moving to this part of the world 24 years ago. It’s also something we don’t get a lot of here, because it’s pretty expensive. But once or twice a year, usually around the holidays, I’ll get out my crab dip recipe and give it a go. It’s worth having to bolus for the Italian bread that goes so well with it. Note: I like the second recipe on this page (Crab Dip Delight) best. 5. 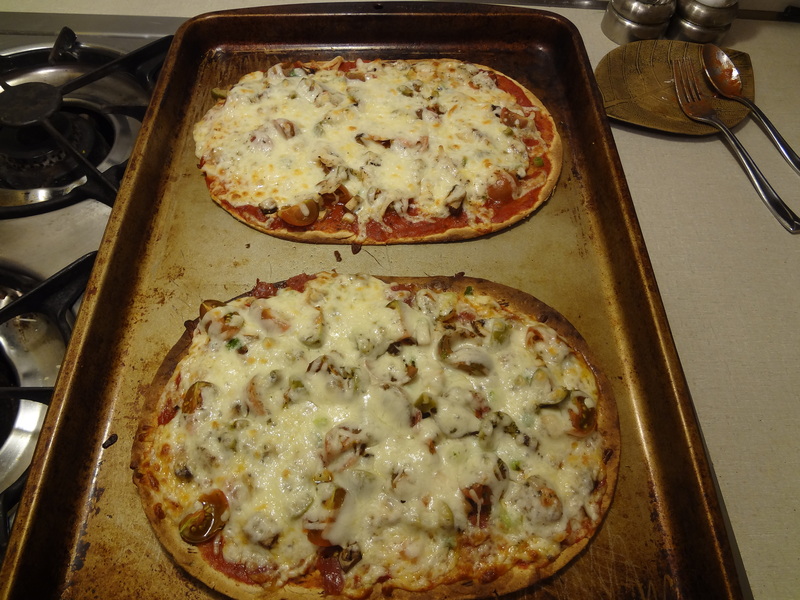 Flatbread Pizza— okay, flatbread pizza isn’t exclusively a Fall recipe, but it’s a great dinner because a) It’s cheap; b) It’s versatile; and c) It’s delicious with LaRosa’s pizza sauce. 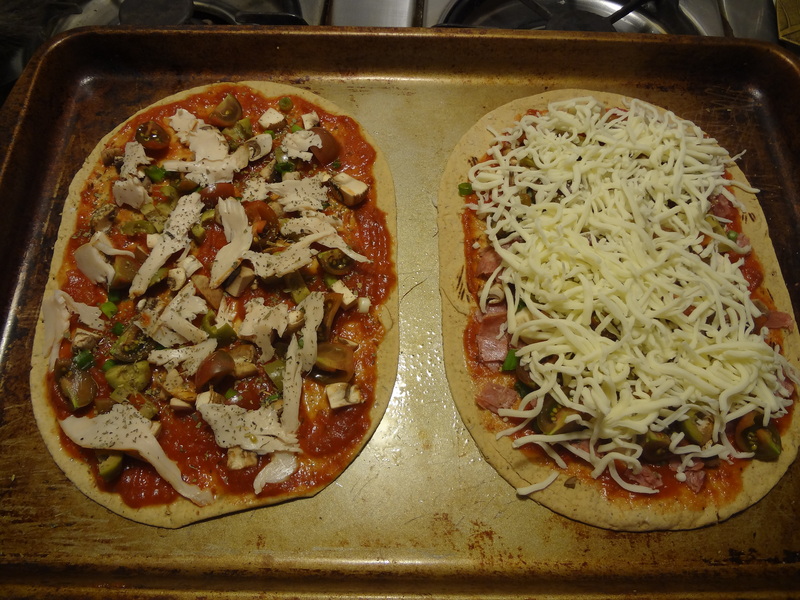 My favorite features green onion, mushroom, and bacon, topped with smoked mozzarella. What’s not to like? 6. Roasted Turkey Thighs— confession: I really don’t like turkey that much. But this recipe was a winner from the word Go, and if there’s a dish that says Autumn more than any other, this might be it. 7. Kicked-Up Ramen— Throw that stupid “flavor pouch” away… you don’t need it. Instead, use a little of this and a little of that to satisfy your own individual palate, and you’ll keep coming back to this recipe. 8. Trader Joe’s Pumpkin Ice Cream— okay, this isn’t a recipe, and to be honest, it’s not something I’d enjoy year round. But a couple times during the Fall, I’ll pick up a quart of TJ’s pumpkin ice cream, which really tastes more ginger-and-nutmeg-snappy than anything else. Regardless of what the label says and what it tastes like, it’s still a nice dessert, when I have dessert this time of year. Those are 8 culinary dishes I like to enjoy as the leaves fall in Autumn. What are yours? Recipe! 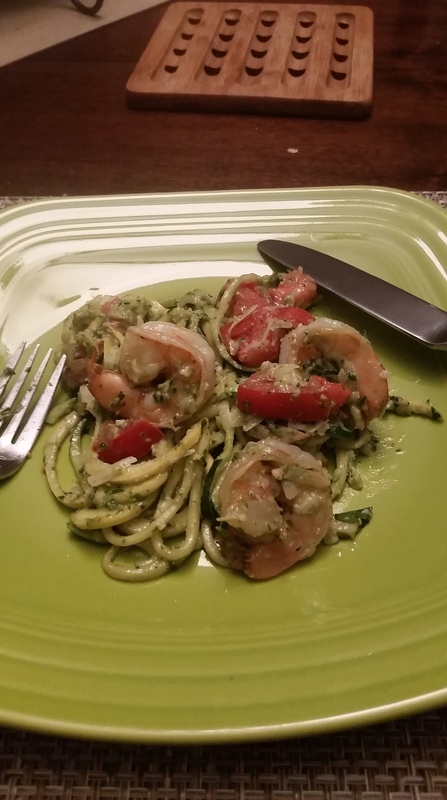 Zoodles with shrimp and pesto. Man, it’s been forever since I’ve posted a recipe. I’m a little rusty, but if you’ll allow, I’d like to give you this two part recipe involving my first foray into what The Great Spousal Unit likes to call: Zoodles. You know… those zucchinis cut up into something approximating spaghetti strands. Zoodles. It’s something that’s burned into my brain now, so in the absence of anything else, that’s what I’m going with. This recipe includes grilled shrimp with mushrooms, shallot, and tomato, tossed in with homemade pesto. First, let’s begin with the pesto. 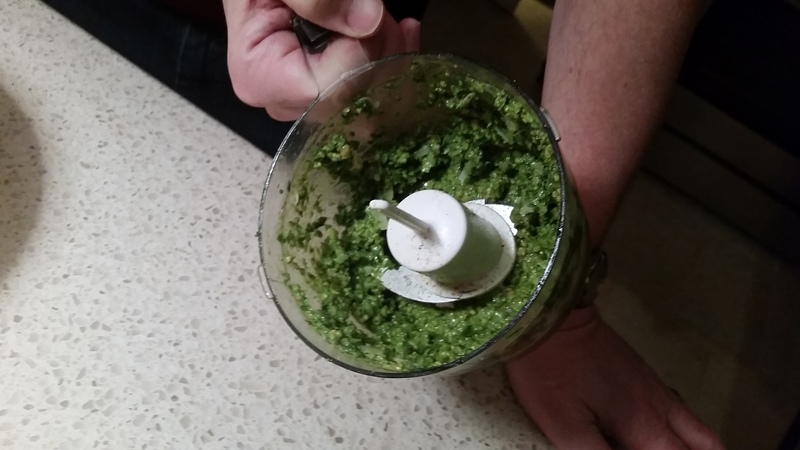 I don’t really know how to make pesto… I just read the back of a jar of pesto in the store and thought, “hey, I can do that”. So this is really an approximation. Meanwhile, I marinated the shrimp in a simple lemon vinaigrette, with salt and pepper. Nothing too out of the ordinary there. 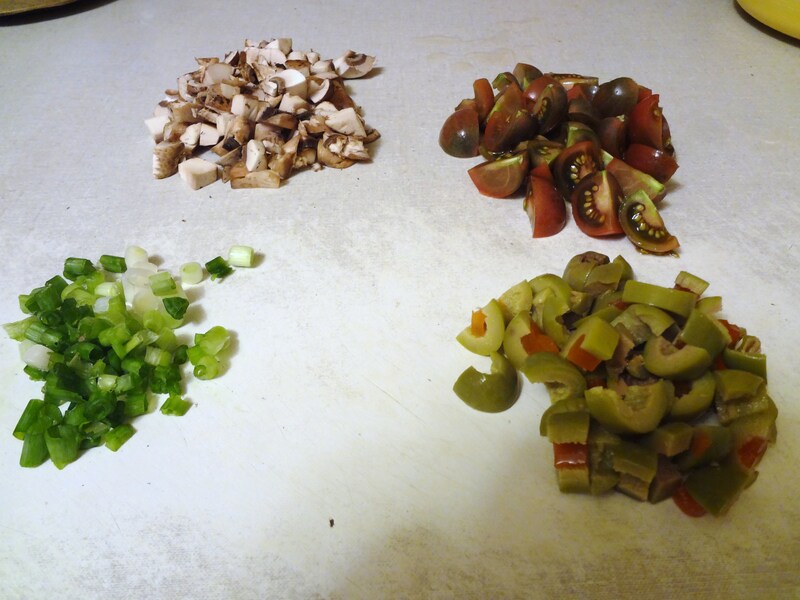 After that, I just chopped up some baby portabello mushrooms, about half a shallot (it was a really big shallot), and one tomato. 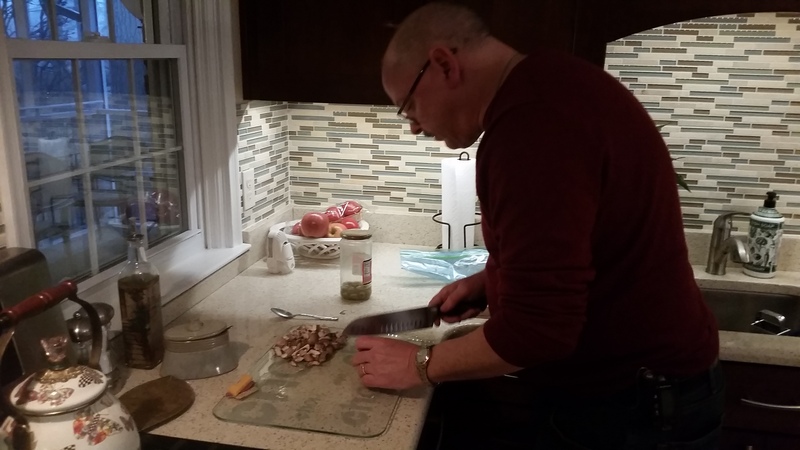 I tossed the mushrooms and shallot in a pan with butter and white wine. I don’t remember which white wine… it was whatever Maureen was drinking. I also got the shrimp on the grill (my new griddle/grill combo that fits right over the middle burner on my stove!). About two minutes per side max. They came out great. At this point, I’ve also put the zoodles in a bowl with a little butter, a tiny bit of celery salt, and garlic. Then I cheated and put the bowl in the microwave to heat everything up. About three minutes was good. 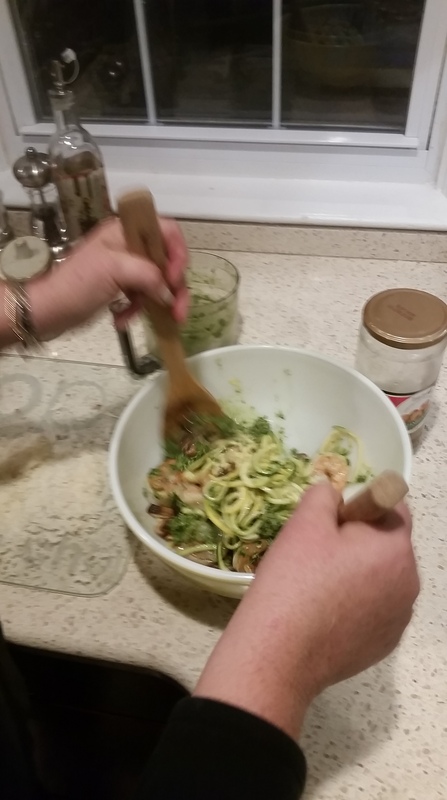 To finish up, I kept the zoodles in the bowl, and added the mushroom and shallots, the tomato, the pesto, and a little more pecorino romano. On the plate, I can tell you that it tasted as good as it looked. Estimated carb count per serving: How do I figure a carb count for this meal? I dunno… maybe 10g? I don’t think this was the perfect interpretation of this meal, but one or two more tries and I might have a real winner here. All in all, it was delicious and mostly healthy. Have you tried something like this before? Have any tips? #DBlogWeek Day 5: Let’s check out the menu. Today is a super busy day for me, so I must confess… I have to punt on this one. Instead of talking about what I’m eating (this morning it was toast and coffeee… boring! ), I’m going to go back and give you three of my favorite recipes I’ve posted here at Happy-Medium. You can use one for breakfast, one for lunch, and one for dinner. Or, as my grandparents used to say, one for breakfast, one for dinner, and one for supper. 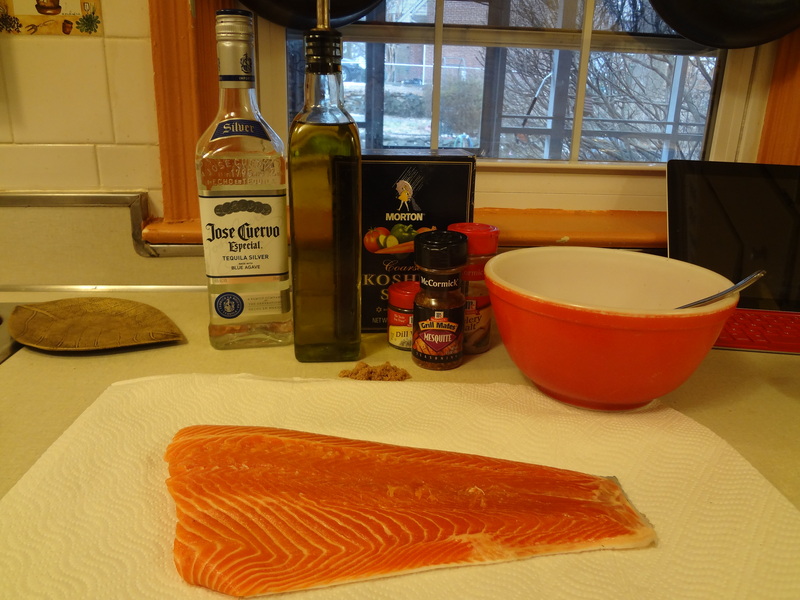 First, my recipe for salmon cured with tequila, among other things. This is a great brunch food, actually. This isn’t a Kosher-exclusive dish, to be sure, but had I not been exposed to the influences I’ve been exposed to here in Baltimore, I probably never would have tried this. And I love it! You’re going to find this is a very easy recipe, and one you can vary according to what’s on hand in your pantry and what you really like. 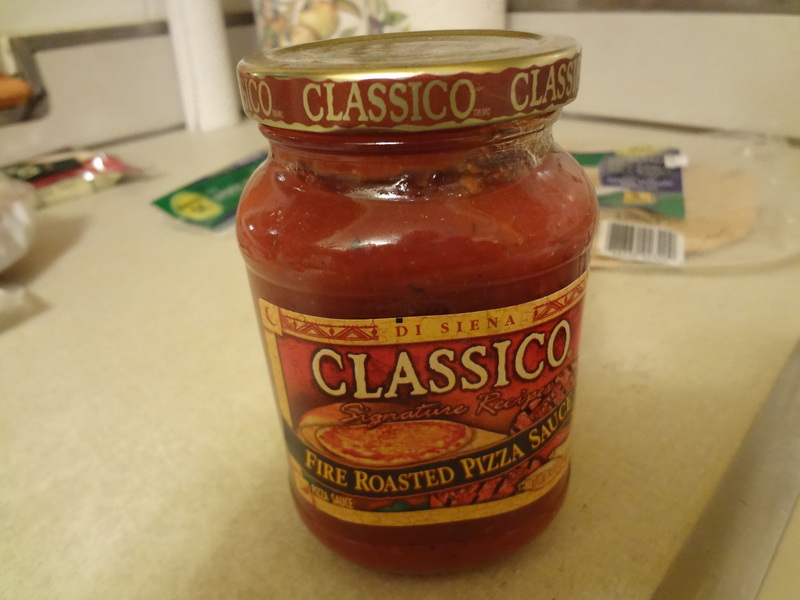 If you close it up tightly after it’s cured, you can probably keep it in the fridge for four or five days. Basically, you mix all of the dry ingredients, then add the olive oil and tequila until you have what seems like a dry paste. If you think your mixture is too wet, just add some more dry ingredients. Now it’s time to get your hands dirty. Put your fish in your deep dish… this is where it will sit for a couple of days. 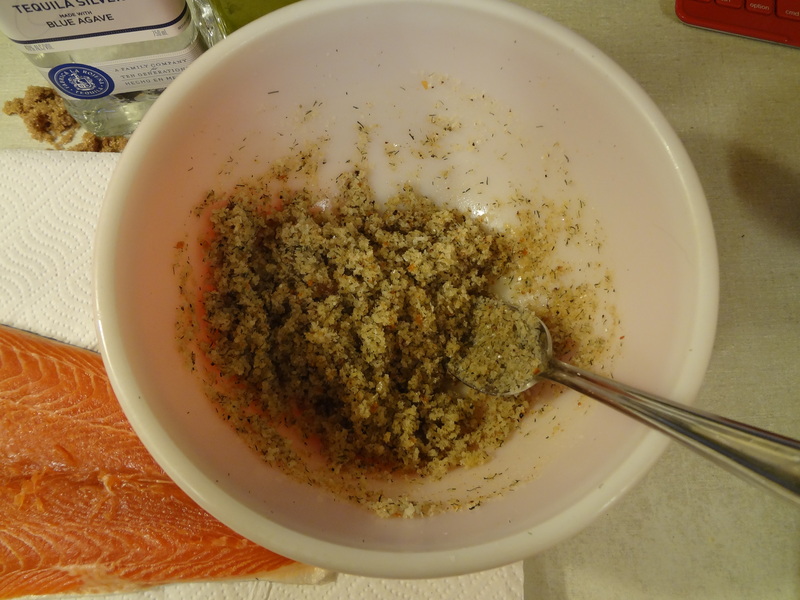 Take your mixture and rub it over your fish. 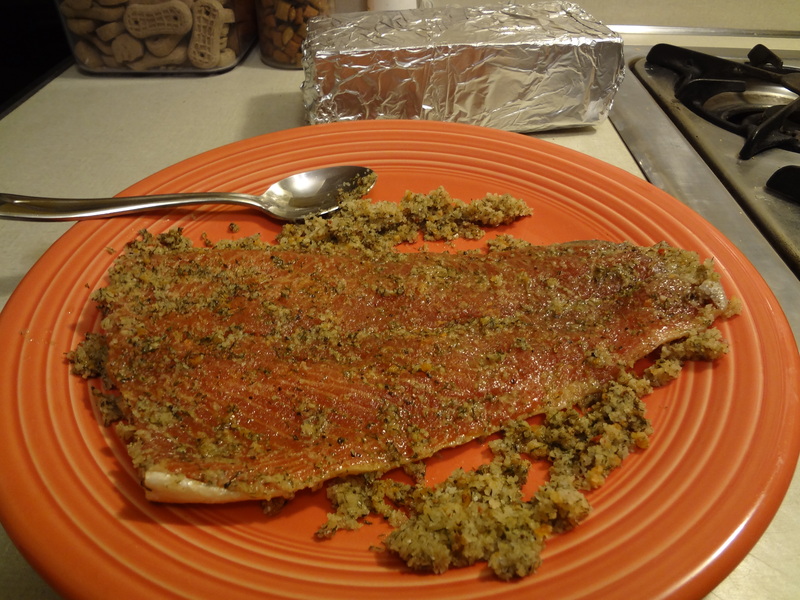 Make sure the mixture covers every single inch of the surface of the fish. If you don’t have enough to cover the fish, make more. 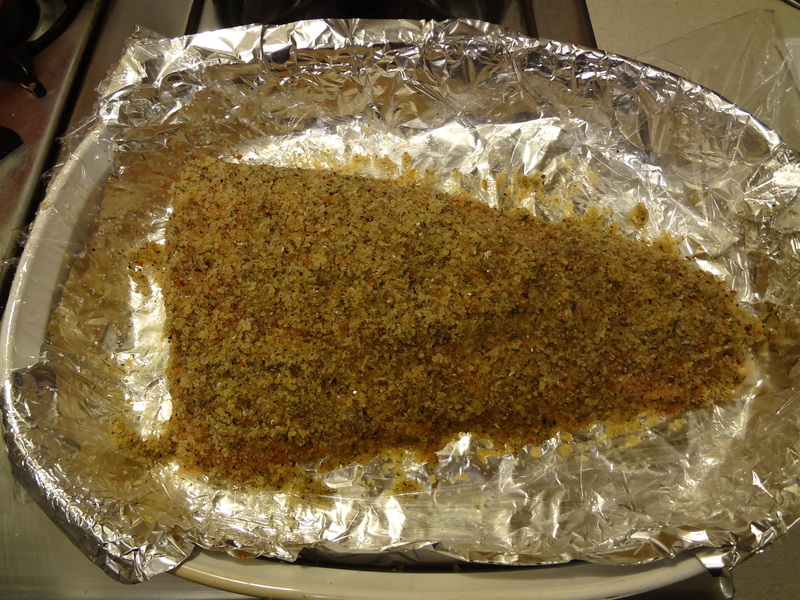 Once the fish is covered in your seasonings, wrap everything up. First in plastic, then in foil. Again, make sure the entire surface of the fish is covered. Place the fish in your refrigerator, and then place your “something weighty” on top. 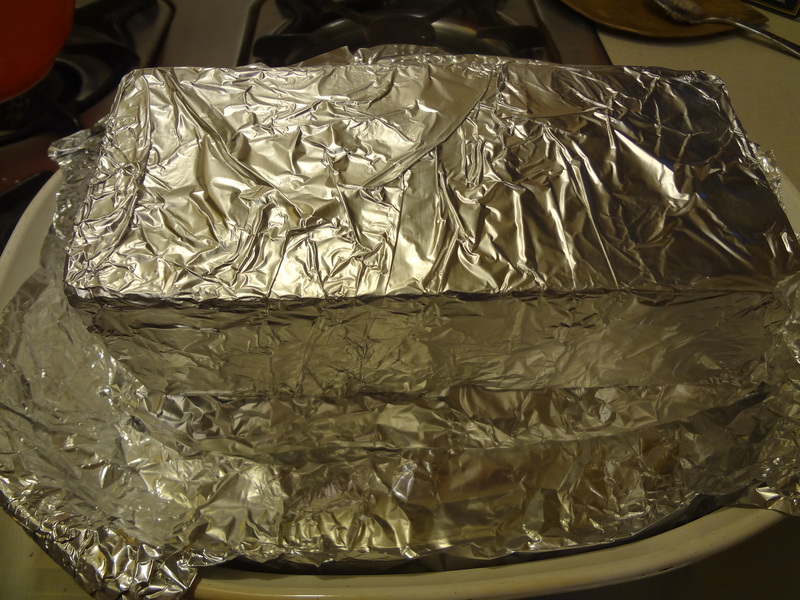 We used a brick from our landscaping outside, and wrapped it in foil. This helps your spices to really get into your fish, and it helps with the curing process too. Then the hard part starts. Because you have to wait 48 hours to unwrap everything and dig in. Don’t be surprised if some of the liquid drains from the fish during this time. That’s normal, and it’s why you have it in a deep dish. Once your 48 hours are up, get the dish out of the refrigerator and uncover everything. If you have to, use a paper towel to remove any leftover moisture. 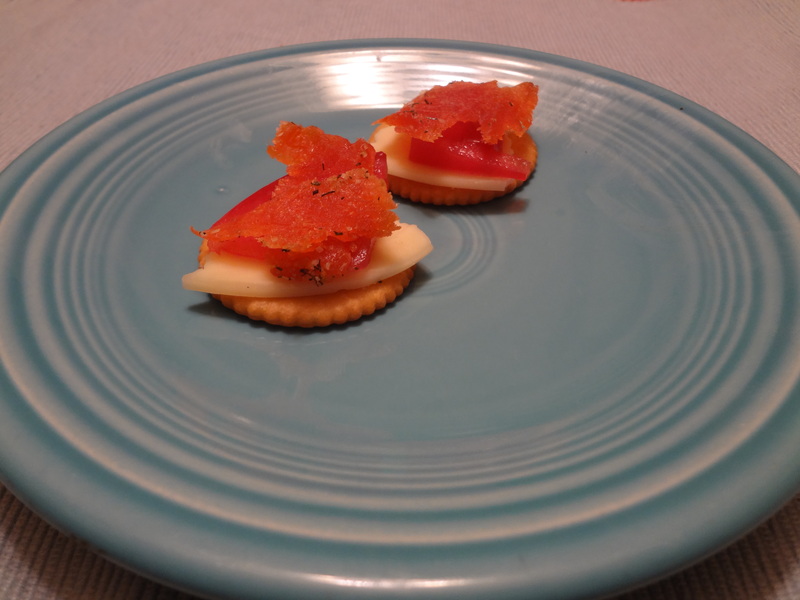 Here’s what the finished product looks like on a cracker with cheese and some tomato. Salty, a little smoky, and melt in your mouth good. 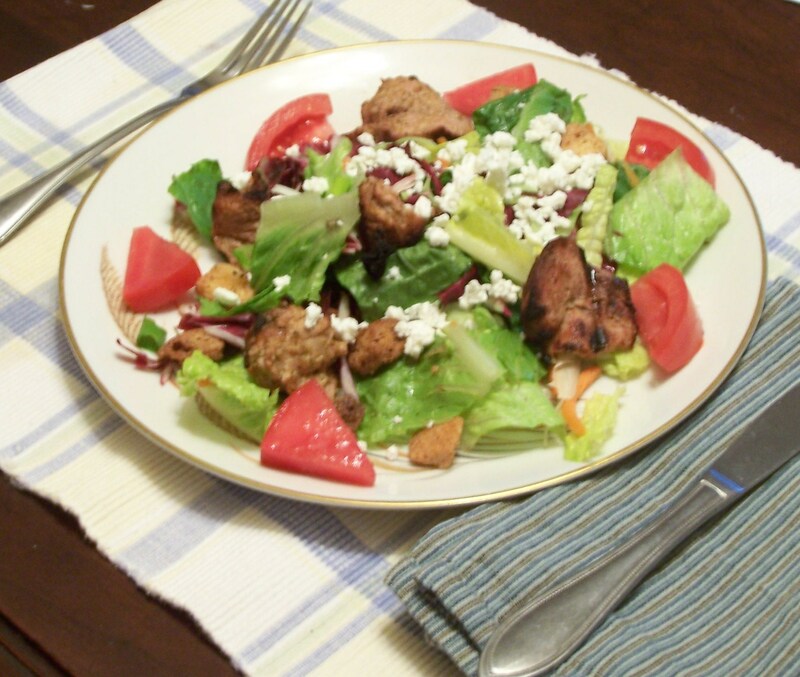 While the pork is swimming around in all that mustardy-sagey goodness, get to work on the salad. Everybody has their own way to do a salad, so I’m not going to give a recipe. Okay, I am, but it’s really more of a description of the salad I made. So that’s not a recipe, is it? Mix it all together in a bowl, and set it aside. When you’re finished grilling the pork (USDA recommends that the pork be cooked to an internal temperature of 145 degrees), let it rest for at least 5 minutes before slicing, if you have to do that. As stated above, I had mine in bite-sized portions already, and cooked them in one of those cage-like things people grill their vegetables in. This is great for lunch or dinner. Trust me… you will love it. 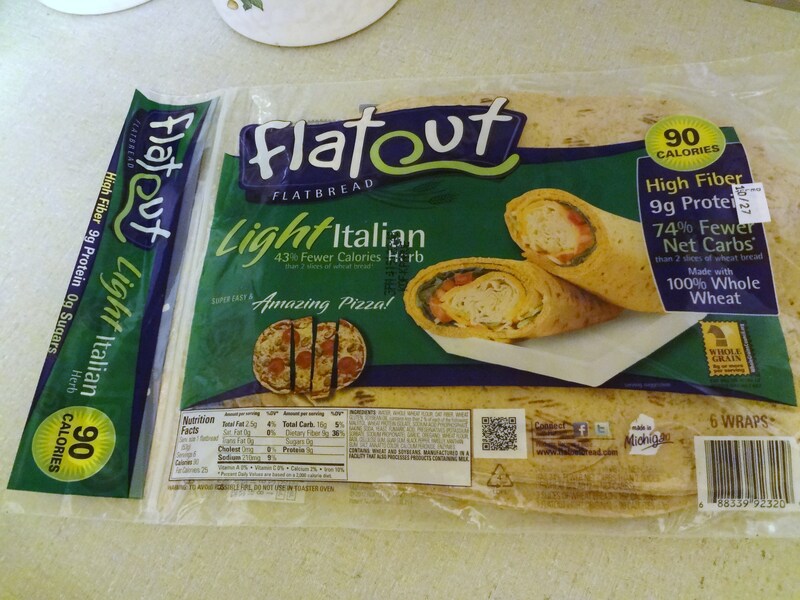 Finally, from last October, a flatbread pizza. We cooked it in the oven then, but we recently prepared this on the grill outside and it was amazing. Sorry if it looks like there’s advertising here; I’m just noting what I used, and I wasn’t compensated in any way for using these products. Well, I hope you made it to the end, and I hope you enjoy one or more of these recipes soon! To find more recipes, just click on the Recipes! 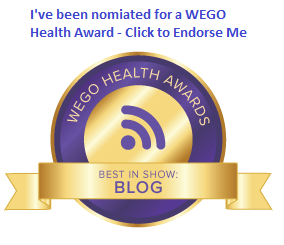 category link on the left. Recipe! Cured fish with tequila. Lots of pictures in this post today… I’ll try to do this recipe justice. Living where I live today is different from anywhere else I’ve lived. I grew up catholic, way back in the old days when I used to go to mass all the time. However, the neighborhood I live in now has a high concentration of Jewish Americans, as well as Russian Jews and Polish, African, and, you get the idea. Over time, I’ve been lucky enough to make lots of friends in this part of the world, which means I’ve been invited to breakfasts, lunches, dinners, and everything in between by people who are as friendly as can be. Often, there’s some kind of cured or smoked fish on the menu. Not a big deal, right? Unless you’re used to eating beef and pork all the time. There’s a huge difference between a meat-and-potatoes Midwestern diet like I grew up with, and a Mediterranean-influenced Kosher diet. But I’ve gotta admit… some of the food I’ve been exposed to has been awesome. Like the gravlax that I put together the other day. This isn’t a Kosher-exclusive dish, to be sure, but had I not been exposed to the influences I’ve been exposed to here, I probably never would have tried this. And I love it! You’re going to find this is a very easy recipe, and one you can vary according to what’s on hand in your pantry and what you really like. If you close it up tightly after it’s cured, you can probably keep it in the fridge for four or five days. I love bagels, but I don’t love what they do to my BGs, so I mostly avoid them. Instead, I opt for small crackers for my lox. I thinly slice the fish, then put it on the cracker with a little cheese (provolone in this case, because… that’s what I had), and maybe some tomato. 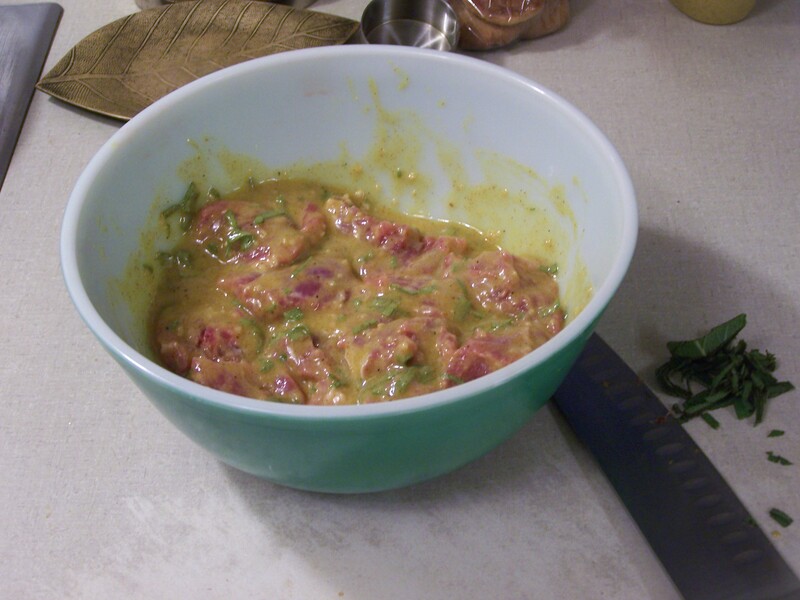 If I can make some sort of swanky mustard sauce for it, I might do that too, but that’s a matter of personal taste. Anyway, the recipe turned out great, and I’m looking forward to enjoying this for the next few days, and sharing it too. So there you have it. Good for breakfast, lunch and dinner. Sorry I don’t have a carb count; any carbs come primarily from the tablespoon of brown sugar in the spice mix, so it can’t be too much. I hope you get a chance to make this recipe too. It’s a great example of something that’s easy, but tasty. Enjoy!